Don't be a dope. Nurture your hope! Life gets heavy sometimes, even if you're just dealing with your own personal dramas. For those of us who are activists for the earth, children, animals, and pretty much any other cause that tugs at our hearts on top of that, sometimes it feels like you can never do enough to change things. It's a challenge to not feel hopeless, but it's also superimportant that we don't. 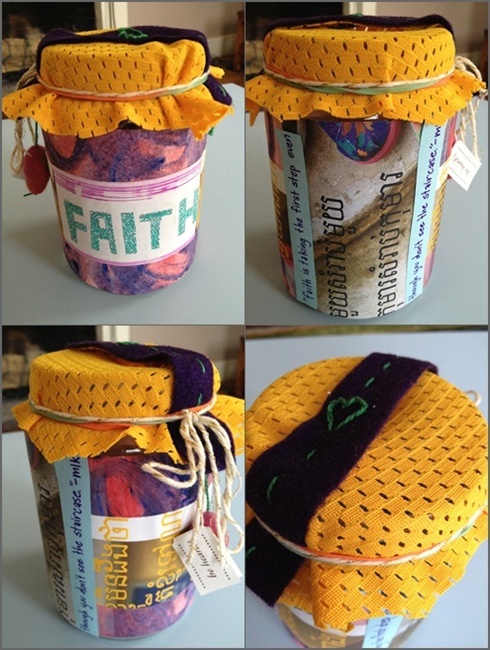 I was inspired by blogger Glamazini who created a God Box to help manage her depression. It's such a brilliant and simple techique. She jots down negative ideas and anxieties onto a slip of paper. She then surrenders her fears to God by putting them into a box, trusting God will take care of her. I love her idea! Writing down negative things didn't feel right for me so I decided to make an affirmation jar instead. I write down the exact opposite of the negative thought I am feeling, read it aloud to myself, and slip it onto the affirmation jar. For example, I'm feeling a lot of anxiety about paying off my student loans, so I wrote "I repay my student loans with ease and joy." Even just writing it offers a little relief and makes me picture a scenario where I have actually paid my student loans. I love my affirmation jar! Whether you make a God Box or an affirmation jar, I just wanted to remind you that you don't have to deal with things alone. You're not dealing with things alone. Don't lose hope! The Universe/ God / Nature/ whatever higher power you believe in is conspiring for good things to happen for all of us. Trust in this and take relief in the truth that everything is working out for the best. Ooo, vision board! Maggi, you just reminded me to crack open my dream folder. (http://flic.kr/p/cPsWVj) I made it this summer and kinda forgot about it even though it's in my desk organizer. :-( Well, happy to see it again! Thank you! I like this idea!!! I will right that affirmation down ASAP!! yay! i know you will have so much fun if you do it! for me, it's better than magic! My pleasure! I can't wait to see what you make. Big hugs!